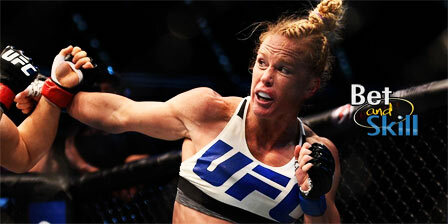 Women's bantamweight champion Holly Holm returns to action on Saturday 5 March to face Miesha Tate in what has been billed as the co-main event of UFC 196, alongside Conor McGregor vs Nate Diaz. This article contains our betting preview on Holm v Tate fight with betting tips, best odds, free bets and no deposit bonuses! It will be Holly Holm's first title defence since she shocked the world by beating the undefeated Ronda Rousey at UFC 193 in Melbourne on late 2015, when a brutal swing of the left foot later secured the most destructive of second-round knockout. The 34-year-old from Albuquerque is 10-0 in MMA fights but she has nearly 50 pro bouts to her credit, though, between MMA, boxing, and kickboxing, and is a multi-time former world champion boxer. Of course, Holm is the better striker here. Against an opponent who pressures forward and looks for the takedown, she will need to circle, stay off the fence, and punish her opponent coming in. She is a striker at heart who has a deep boxing background and showed in her last fight she’s capable of landing vicious kicks. The concern with Holm is her grappling game, as she’s not 100 percent comfortable on the canvas. Miesha Tate is preparing for her second title opportunity having previously taken Ronda Rousey three rounds at UFC 168 before being forced to submit to her signature excruciating armbar hold. It was her second loss to Rousey, the first coming when Tate was the queen of 135-pound females as Strikeforce champ. Even with those two defeats, Tate has a record of 17-5 with a 47 percent of her fights by decision. She has won four straight fights with the last in July over Jessica Eye. Miesha Tate is one of the toughest athletes in the sport. She's a talented wrestler with some aggressive striking. She is a pretty polished grappler and wrestler, and she has six submission victories under her belt. Miesha Tate could stand a chance at a submission win if she can get Holm to the mat. The concern with her is that she gets tired rather quickly and doesn’t stand a chance in terms of striking. "Holly Holm v Miesha Tate predictions, tips, odds and free bets (UFC 196)"